Upper motor neuron syndrome (UMNS) is a collective term for positive signs (ie, different clinical forms of involuntary muscle overactivity) and negative signs (impaired voluntary movement and motor control) that occur in patients with lesions of the descending corticospinal system. Such lesions may occur in patients with cerebral palsy or multiple sclerosis and in those who have experienced stroke, traumatic brain injury, or spinal cord injury. Patients with UMNS may experience impaired voluntary and involuntary motor activity and interference with limb positioning, along with poor hygiene, pain, abnormal gait, and reduced activities of daily living. Effective treatment often requires integration of a variety of conservative, interventional, and surgical options that are targeted to a specific patient’s functional impairment. Botulinum neurotoxin (BoNT), a recent addition to the treatment armamentarium, has been shown to reduce upper and lower limb spasticity and other forms of muscle overactivity in the UMNS. In 2010, the indication for BOTOX® (onabotulinumtoxinA [BoNT-A]) was expanded by the US Food and Drug Administration (FDA) to include treatment of upper limb spasticity in adults . Neurologists, physiatrists, primary care physicians, physical therapists, speech and language pathologists, and other healthcare professionals involved in the treatment of adult spasticity/upper motor neuron syndrome using neurotoxin therapy. Febuary 2011 through Febuary 2013. Original Release Date: Febuary 2011. This activity is jointly sponsored by Beth Israel Medical Center and Scientiae, LLC. Spasticity and other forms of involuntary muscle overactivity are associated with common neurological disorders, including stroke, cerebral palsy, traumatic and hypoxic brain injuries, multiple sclerosis, and spinal cord injury. Within these populations, spasticity, a major form of muscle overactivity, occurs at a variable frequency. While the incidence of spasticity is not known with certainty, the condition likely affects over half a million people in the United States and over 12 million people worldwide.7 The aging population and improvements in acute management of traumatic brain injury (TBI) and stroke will likely increase the prevalence of spasticity. Focal treatment—ie, effects narrowed to muscles creating dynamic joint deformities—can be achieved by using neurolytic agents such as phenol and alcohol, and more recently with chemodenervation agents such BoNT. It may be prudent to administer phenol to large proximal muscles when total BoNT dosing for many smaller distal muscles is likely to approach its upper limit. Phenol is technically more difficult to administer because the injector has to hone in skillfully on a motor nerve using iterative electrical stimulation.37 Such a technique works poorly in uncooperative patients or severely dystonic patients whose contractile tension obscures the effect of the injector’s twitch technique. The impact of reductions in muscle tone can also vary widely among patients, yielding inconsistent benefit.40 A number of functional scales have been used in spasticity-treatment trials. Broad scales of global function may not be sensitive to small but meaningful changes that are important to the patient.40 The Disability Assessment Scale is an ordinal self-report instrument that measures change in target tasks chosen by the subject and the investigator from among the areas of hygiene, dressing, pain, and limb positioning.39 However, the Disability Assessment Scale was originally created for research purposes and has not been widely used in the clinical setting. Note: Only BoNT serotypes A and B have been approved by the FDA for clinical use. Patients must be aware of the nature and onset of BoNT-induced changes. In particular, they must understand that the effects of medication may not become apparent until 5 to 7 days after injection, with peak effect occurring after 2 to 6 weeks. The duration of effect depends on the type of toxin, dose, muscle, and severity of the spasticity but is typically 3 to 6 months.19 BoNT may be re-administered when the effect wears off and the original clinical problem redevelops. At the present time, clinical consensus is not to reinject BoNT before 90 days have elapsed from a previous injection.41 Clinical data have demonstrated that improvements in upper50-52 and lower53 limb spasticity are maintained with repeated injection. 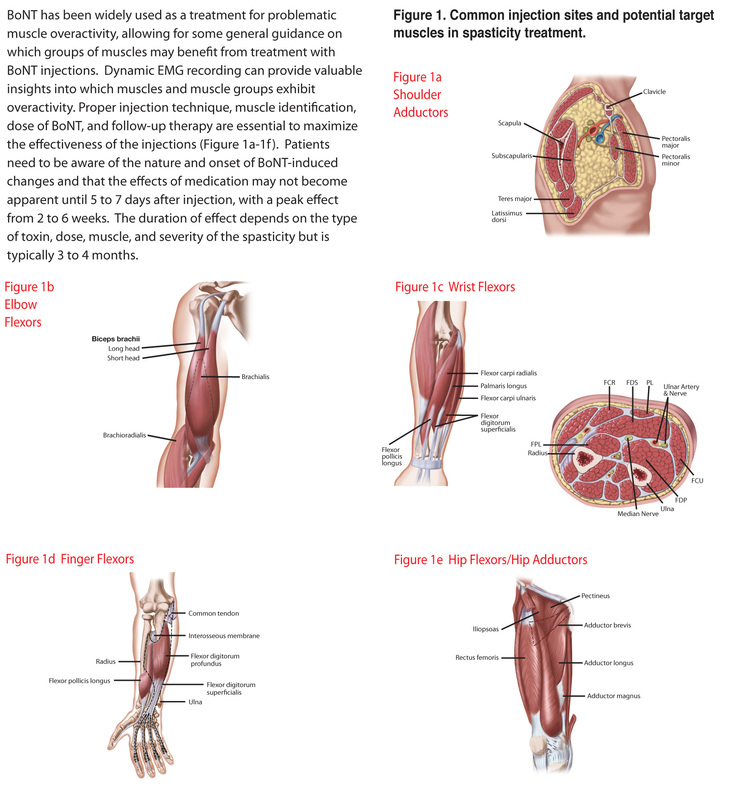 Patients with the UMNS often require injection into multiple target muscles. It is important, therefore, to stay within accepted limits for total-body BoNT dose.59,60 The lowest effective dose should be used to achieve the desired outcome and, except in select situations, an interval between injections of at least 90 days is recommended. Numerous publications have documented the utility of onabotulinumtoxinA, abobotulinumtoxinA, and incobotulinumtoxinA in the management of spasticity; however, limited efficacy in spasticity has been shown with rimabotulinumtoxinB.32 Of the four BoNT preparations available in the United States, only onabotulinumtoxinA is approved by the FDA for the treatment of spasticity (see Table 4). No other formulation of BoNT is FDA approved, although clinical studies have been reported with data on safety. 7. Vanek Z, Menkes J: Spasticity. Medscape Web site. http://emedicine.medscape.com/article/1148826-overview. Accessed April 29, 2010. 15. Centers for Disease Control and Prevention: Spinal Cord Injury (SCI): Fact Sheet. www.cdc.gov/ncipc/factsheets/scifacts.htm. Accessed August 23, 2010. 61. Dysport (abobotulinumtoxinA) prescribing information. Wrexham, UK: Ipsen Biopharm Ltd.
72. BOTOX Cosmetic (onabotulinumtoxinA) prescribing information. Irvine, CA: Allergan, Inc.